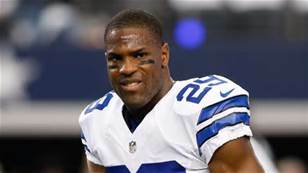 Last season DeMarco Murray led the NFL in rushing with 1,845 yards with the Dallas Cowboys. The 27-year-old Murray has since moved on to running the ball for the Philadelphia Eagles this season. Here’s the question: Can Murray duplicate his league-leading performance with a new team this year? Let’s look at one aspect of Murray’s 2014 season: his age. Murray led the league in rushing yardage at the age of 26. Did you know that of the 45 players who led the league in rushing yards since 1970 that 31 of those 45 (69%) were age 26 and younger, while 14 were 27 or older. Here’s a breakdown of the age of the NFL rushing champion from 1970-2014. The youngest rushing champ since 1970 was Edgerrin James at age 21 in 1999 with the Colts; the oldest was 31-year-old Curtis Martin with the Jets in 2004. Here’s another rushing stat: Of the 86 runners who gained 1,500 or more yards in a season, 55 (64%) were under the age of 27. The breakdown: age 21 (2), age 22 (5), age 23 (8), age 24 (11), age 25 (10), age 26 (19), age 27 (11), age 28 (8), age 29 (6), age 30 (2), age 31 (3) age 32 (1). Finally, there have been 132 runners who gained 200 or more yards in an NFL game since 1960. Of those 132, 72 percent (95) were under the age of 27. In fact, 70 of the 132 (53%) were either age 24, 25, or 26. The youngest was Clinton Portis who was 21 years, 119 days when he had 228 yards in a game in 2002. The oldest was John Henry Johnson who was 34 years, 321 days when compiled 200 yards in a 1964 contest. Only seven runners age 30 or older gained 200-plus yards in an NFL game since 1960. There’s no doubt that its the runners under 30 who are making all the noise in the NFL.